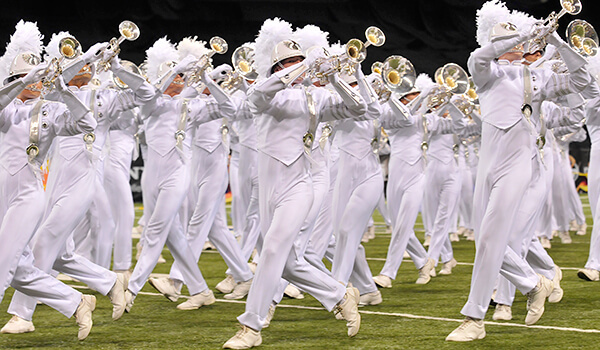 The 2010 Drum Corps International Tour ended as it had 13 times previously, with the Blue Devils in first place, capping a second straight undefeated season for the Concord, Calif. corps. Bluecoats made it into the top-three for the first time ever, with a high score that would have placed first at any of the first 12 DCI World Championships. The Madison Scouts placed back in Finals after a 15th-place finish the year before. Phantom Regiment, still smarting after finishing in 9th place in 2009 after winning the DCI title in 2008, popped back into the top half of finalists in 6th place with "Into the Light," based on Michael Kamen's "The New Moon in the Old Moon's Arms." Kamen started his professional musical career as an oboist in a rock classical fusion band. He became a hot commodity working with multitudes of folk, jazz and rock musicians as diverse as Jim Croce, Herbie Hancock, David Bowie and Metallica. He also collaborated with Pink Floyd on their 1979 album, "The Wall," and worked with the band on the 1982 film of the same name. Kamen wrote 13 ballads before venturing into the motion picture industry in 1976, going on to write film scores for the first three "Die Hard" films, "X-Men" and many other Hollywood productions. His smash hit, "Everything I Do, I Do for You," written for the 1991 film, "Robin Hood: Prince of Thieves," hit the top of the pop charts across the world. After writing the score for the 1995 film, "Mr. Holland's Opus," Kamen founded the Mr. Holland's Opus Foundation, which has donated countless musical instruments to schools and individual students in lower socio-economic neighborhoods. After suffering from Multiple Sclerosis, he passed away in 2003 at the age of 55. "The Old Moon in the New Moon's Arms," written for the new millennium and released in 2000, was regarded by Kamen as his "first classical symphony." The piece was inspired by the history of the Anasazi people, Native Americans who lived in the Southwest and who mysteriously vanished a millennia ago. In their understanding of the working of the heavens, they were more advanced at the time than European civilizations. The Anasazi left their legacy in paintings on canyon walls across much of the American southwest, images that Kamen sought to capture in music. A recurring inspiration in the music was that of the Kokopelli, the humpbacked flute player that is so often used as a symbol of the American southwest. Consequently, in the original, there is an extensive use of flute solos, as well as solo lines for cello, symbolizing two of the main characters in Anasazi legend. 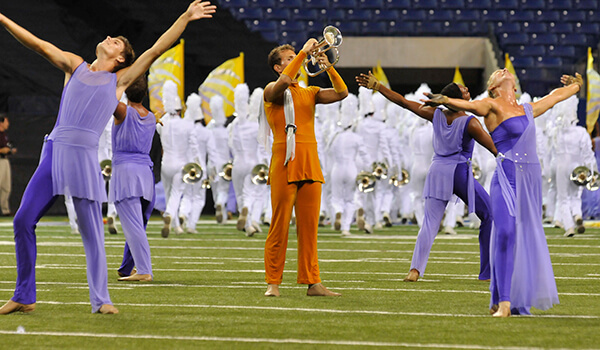 Phantom Regiment's production started with only the color guard and a character referred to as the Spirit Guide (represented by a flugelhorn player in an orange-yellow costume) out on the field. The Spirit Guide entered from the upper right tunnel of Indianapolis' Lucas Oil Stadium, while the rest of the corps, hidden in the lower left entrance tunnel, performed an opening chorale theme. When summoned onto the field by the Spirit Guide, the horn line, in two squiggle arcs, musically and physically rose and fell under his direction. It must have taken nerves of steel to maintain the composure necessary to be the center of attention and still play so beautifully. The flags, deep maroon and white on a yellow background, shimmered against the soft pastel lavender of the color guard costumes. It was a color combination that shouldn't have worked, but it did. The Spirit Guide wasn't always featured on the field. When he wasn't playing, the music was of a more turbulent nature, refusing to be soothed by his distant presence. Toward the end of the show, he led the brass players out of the darkness of the turbulent music into the corps' trademark chevron for a full-corps glorious statement of the melody. The drums and horns ultimately swarmed to their final destination, somehow all squeezing into the upper right tunnel from where the Spirit Guide had first appeared. The Spirit Guide finished off the production surrounded by 14 color guard members up front, with one last sustained note reaching toward the Moon. With the rest of the corps totally out of sight, a soft chord floated from out of the tunnel, comforting in its solace, embracing the audience in the arms of the New Moon. For this week only, you can save on the DVD that contains this complete Phantom Regiment performance, along with all finalist corps from the 2010 DCI World Championship. Buy the 2010 World Championship DVD set. (Available this week only for 20% off. Regular price: $59.95.) Discount DVD offer ends Monday, Feb. 24.